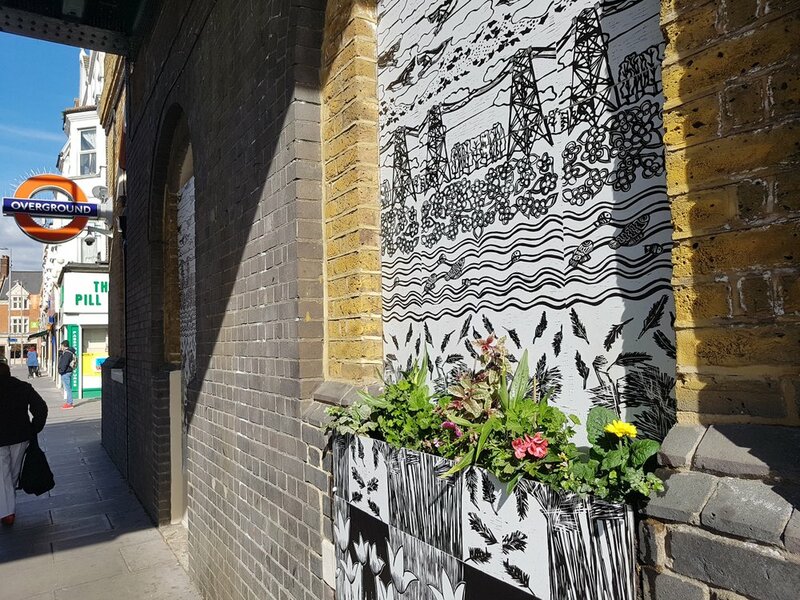 With the help of a St James Street Big Local Residents Grant, this mural part painted, part aluminium linocut panels transforms a previously neglected flank of wall on the corner of Walthamstow High Street. From finding permissions, applying for planning, designing and making; the artist personally delivered the project from start to finish. Was also the basis for MA Fine Art Professional Practice Report for which a Distinction was given. A unique and dynamic piece of artwork, 'Mural for St James' is inspired by the Walthamstow Marshes. The artist, Farah Ishaq, has always lived close by. The double-award winning design came from an idea to fill the alcoves under the railway bridge at St James Street station – an awkward space that has been empty for several years prior. A series of different coloured linoprints on aluminium have been installed since December 2017 at all of the London Overground stations in Waltham Forest. Both celebrating the London Overground's 10th birthday and starting a collaboration between Arriva RL and WF Council with an art trail. 50cm diameter plaques are installed in site specific locations on the platforms and in stations at Chingford, Highams Park, Wood Street, Walthamstow Central, St James Street, Walthamstow Queens Road, Leyton Midland Road & Leytonstone High Road.